You might have read a few of my post where I say that my back is bothering me. Well, one way I relieve the pain is by rolling it out on a foam roller. I wrote about that in my post Rolled Out My Back Pain. A bit ago, I did that method and it was not working. I kept trying it and trying it. It didn’t make sense that my back was not “cracking” back into place. If you have ever had a pain, especially back pain, it might have had you thinking about it. As you go through the day, it draws your attention because, well, it hurts. So I was thinking about it and trying to examine it from a sensation perspective. As I moved through the day it would bother me. I began to get the feeling that it was compressed. Whether my bones were compressing against each other causing the pain or the bones were pressing on a nerve or something, I don’t know. In fact it has been so long ago that this happened, I don’t even remember what it felt like EXACTLY. But my sense was that it was compressed. That would have explained why rolling on it, trying to crack it and compress it more was NOT working. It was not relieving the pain. So then I thought, what if I expand it? What if I open it up? Ideally, an inversion table would be great! But, I don’t have that. I remember one time I tried hanging off of our breakfast room table but it is difficult to relax doing that. The idea that the table is going to flip over does not help me relax. I decided to try my stability ball. It is a little smaller than would be optimum, but it works. It takes a lot of concentration to be able to relax the upper part of my back – because that is where it felt jammed up – and not go so far as to allow my head to rest on the ground. My stability ball is not that big. I had bought a big one, but I traded it with my co-worker (at the time) because the one she bought was smaller. The ideal size for a stability ball when you plan on doing exercises on it, is to be able to sit comfortably on it with feet on the ground and your thighs parallel to the ground. Well, my knees were below my hips on the big one and her knees were higher than her hips and the switch allowed us the proper size. So mine is perfect for sitting on and doing exercise, but it is not so great to lie prone on. 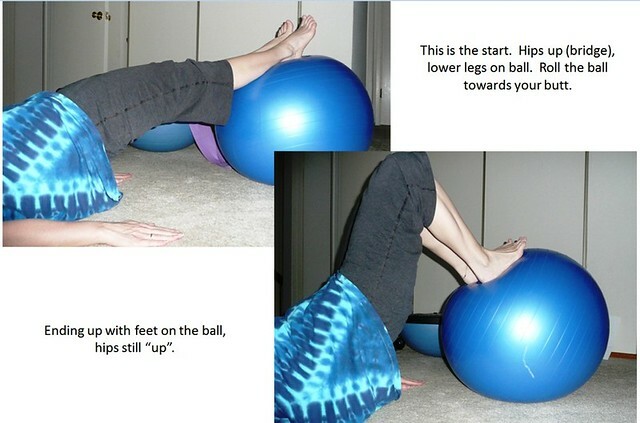 I did post a stretch where I lie on it on my back, Stability Ball Stretch. Mine is a good size for that. It is a good size for everything else, like I said, it is the right size, but just kinda small for hanging over it face down. But it worked. My back didn’t need to be cracked with pressure it needed to be opened up. So now when I get a sense that my back is getting out of whack, I sleep with my roller. I have a round one and a half round one. But if my back hurts before I try the sleep relief, then I hang over the ball. If that doesn’t work, then I roll on the foam roller. To begin with, I try to be very careful because I don’t want to be in pain. My wonderful friend that helped me with my back is gone so I need to make sure I don’t get to the point of needing her help. I need to be able to “fix” it myself. And not letting it get out of adjustment is the best help. As I mentioned in my foam roller post, I am not recommending anyone do this because I don’t know your particular back situation . . . so I can’t say if this would be good for you or if it would help. But I am saying, “Ahhhhhhhhhh!” It helps me. It is a different sensation than hanging over from the hips and letting your head help stretch your back. The ball rounding out the back really seems to open it up. And whatever was going on in my back, that did the trick! Do you have a stability ball? What do you use it for?